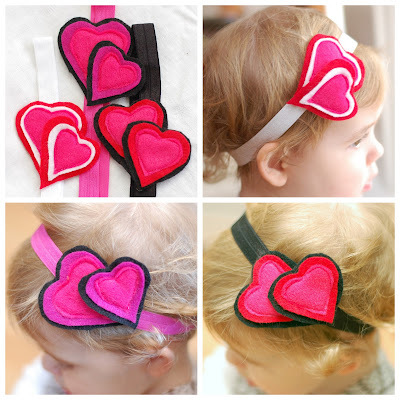 SewBaby Crafts: Custom Valentine Headbands--Order Before February 6th for Feb 13th Delivery! Custom Valentine Headbands--Order Before February 6th for Feb 13th Delivery! Elastics are available in shocking pink, cherry red, black, or white. And if you email me to order a Valentine headband before February 6th, you'll get the special holiday pricing of $12.00 per headband, with free shipping! Further discounts available for 3 headbands or more (includes additional designs). But you don't need to be limited to these colors--adding baby pink or burgundy to the mix would also look great for Valentine's Day, or go wild with any color combination for a double-heart headband that she can wear all year round! All available felt colors are shown below.